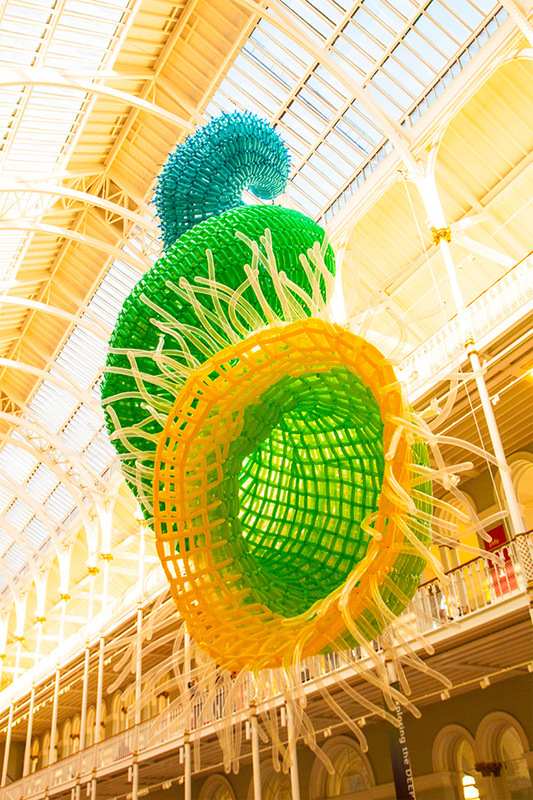 New York artist Jason Hackenwerth, known for his organic and biological forms made from latex balloons, just unveiled his latest work at the Edinburgh International Science Festival in the Grand Gallery of the National Museum of Scotland. Titled Pisces the sculpture is the artist’s interpretation of the legend of Aphrodite and Eros: in Greek mythology, Aphrodite, the Goddess of love and her son, Eros, escaped the fearsome monster Typhon by transforming into a tightly woven spiral of two fish, a figure which later became a constellation called Pisces. The spiraling form is made from 10,000 balloons which took three staff members nearly six days to blow up, after which Hackenwerth and his assistant Leah Blair wove carefully into this three dimensional structure. Pisces will be up through April 14th, 2013 and you can see much more of it on Flickr.